What is your position on Prosperity Gospel? I find the notion ridiculous, if not downright absurd! The premise that tithing promises health and wealth seems quite far-fetched. It does not promote spiritual growth. In fact, the only growth I see it promoting is the personal pocketbooks of the pastors and/or preachers behind the pulpit. Though I can understand and agree that donations to church groups and organizations can be fulfilling for some and even, to a degree, necessary for the continued existence of an organization (non-profit, in theory! ), the in-your-face over-the-top request below is one I can’t fathom how anyone can actually make with a straight face, much less be absolutely serious about. Thanks for the good question, Richard. Short version: I agree with you 100%! How Prosperity Gospel even qualifies as a religious teaching is beyond me. Yes, Prosperity Gospel preachers talk about God, the Bible, and other religious subjects. But the goal of this “Gospel” has nothing to do with love for God or love for the neighbor. Instead, it’s all about gaining worldly wealth and success for oneself. That, to me, is not religion. It is a spiritually bankrupt substitute for religion. However, despite its spiritual bankruptcy, it does serve a use for some people as a stepping stone toward something better—which, I believe, is why God allows it to exist. 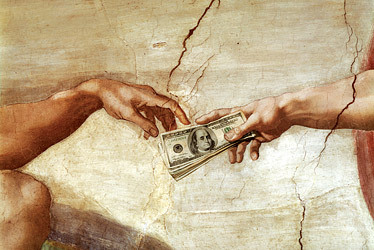 First, what is Prosperity Gospel? Prosperity Gospel, or Prosperity theology, is the idea that if we have faith that God wants us to be wealthy, affirm God’s desire to bless us with wealth, pray for that blessing, and make generous contributions to the church, God will indeed bless us with abundant material wealth and success. In churches that preach the Prosperity Gospel, wealth is seen as synonymous not only with success, but with being in God’s favor and good graces. Prosperity Gospel preachers themselves are usually the most successful practitioners of their “Gospel.” They live in luxurious houses, drive fancy cars, and generally display their wealth quite openly. In fact, they often point to themselves and their ministry as proof of the truth of the Prosperity Gospel. And their people eat it up. It doesn’t seem to occur to these people that their own hard work is what’s bankrolling the high-living preachers with their fancy church headquarters and posh homes. Instead, the people who follow these preachers take it as inspiration and proof that they themselves can also become wealthy, live in posh houses, and drive fancy cars. It’s a toxic mix driven by an unbridled desire for wealth. That is obvious to any objective outside observer. But from the inside, it looks like God’s own Gospel truth. That’s because Prosperity Gospel tells its devotees exactly what they want to hear. Most members of Prosperity Gospel churches are poor to middle class people who struggle for their daily bread. Most of them live hand-to-mouth, with little to no savings and investments to fall back on. To these people, the message that God will bless them with material wealth has a powerful appeal. Loving God and loving our neighbor (meaning our fellow human beings) is what religion and spirituality are all about. And though having enough money to provide for ourselves and our family certainly helps put us in a position in which we can care for others, it should never be the goal of our religion and our spiritual practices. Prosperity Gospel substitutes material goals for the spiritual goals that are the true focus of all genuine religion. It rips God off the throne of heaven, and puts money there instead. God and religion become mere means for achieving materialistic goals. That is a travesty of religion. And it is. What kind of a “religion” enriches its leaders at the expense of its members, and lures people in with promises of material wealth and glory? These are the types of passages that Prosperity Gospel preachers quote in their sermons. But isn’t religion supposed to be about spiritual goals? Why does the Bible promise material blessings to the faithful? First, it’s not entirely false that people who are faithful, honest, and law-abiding in their dealings will generally do better materially than those who are not. Yes, there are many exceptions. Some people do get rich through dishonest and illegal means. But generally speaking, people who are decent, law-abiding, industrious types who put their shoulder to their work and don’t get sucked into shady dealings and immoral activities will, over time, tend to have their material wants and needs satisfied. God is a realist and a pragmatist. And God knows that many, if not most of us start out in life aiming primarily for our own comfort, pleasure, wealth, and power. And so God seeks to harness those materialistic goals to get us moving toward more spiritual goals. The Bible never says that material prosperity is the goal of religion. Even the promise from Deuteronomy quoted above is about faithfulness to God first, and material blessings second. What the Bible does do is use our materialistic and self-centered goals as bait to get us hooked, and reel us in toward better and higher goals. Prosperity Gospel is false religion. And yet, it reaches millions of people with something like a religious message that includes commandments to believe in God, pray, and live a decent and honest life. So although Prosperity Gospel is a poor excuse for a religion, it at least gets its followers thinking about God and the Bible instead of focusing their mind and heart entirely on material things. Eventually, if the followers of Prosperity Gospel are to have real religion and spirituality, they will have to set aside material wealth and success as their primary goals in life, and instead adopt as their primary goals the ones Jesus Christ taught us. For many people who are materialistic in focus, Prosperity Gospel serves as a stand-in for religion until they are spiritually mature enough to move on to real religion. And so, even though Prosperity Gospel is a false religion, it has its uses in God’s spiritual economy. That is why God allows it to exist. Think of Prosperity Gospel as a religious gateway drug. Once people get hooked on it, they’ve started down a religious path. Sooner or later many of them will find out the hard way that Prosperity Gospel either it doesn’t work for them or doesn’t satisfy their real spiritual needs. Then perhaps, having gotten into the habit of thinking about God and the Bible, they may graduate to a real religion that leads them toward the spiritual goals of loving God above all, and loving their neighbor as themselves. Sadly, history keeps showing us the end result which comes to so many of these mega-evangelists, yet crowds still flock to their cause like lemmings off a cliff. I agree that their core purpose of spreading the word of faith does, indeed, have value regardless of denomination. However, the flagrant, self-serving means by which they execute such should certainly subject them to a greater judgement than we can ever pass upon them ourselves. But, it is fun to chide them and their methods, if one can tolerate the stupendous preposterousness of it all. Thanks for your thoughts. I am reminded of Jesus’ saying about the hypocrites: “They have their reward.” It’s already in their hands. But it doesn’t last. Material wealth and power stay behind when the body hits the grave–if the blighters manage to hold onto ’em that long. Thanks also for the typo fixes. Seriously? I want my money back! Did you keep your receipt? A gospel rapper by the name of Shai Linne wrote a song Entitled “False Teachers.” In that song he makes mention of the prosperity gospel and how people are making money their god instead of Christ. He also calls out about 13 (not exact) prominent t.v. ministries and the one at the top of the article is one of them. We must continue to cry loud and spare not in order for God’s people to be free. Awesome post! He clearly addressed social media with his request to friends and supporters, soliciting for funds, and this is also clearly pointed out. And, to think it is the devil’s work trying to discredit him is even funnier. Though there are many people who fall prey to the soothing tongue of these mega-evangelists due to their own over-yearning desire to feel purposeful and to belong, I think these pastors and preachers actually believe a great number of people lack common sense and follow like sheep with herd-like mentality. They deliver, with intent, messages worded with the proper inflection to manipulate any of those willing to listen. I can only shake my head in disgust. I believe in the purpose of evangelizing. I agree with it ‘s meaning and intent. And though I am still on the fence with what I may believe spiritually, I certainly see no harm in those spreading faith’s word with good intention if that is what they choose to do. You perform the same task with this site and blog, yet you see no purpose to solicit hoards of cash or other material donations to support your cause. And that is the way it should be. People reaching out to people, without ulterior motives or hidden agendas. And certainly not by idolizing oneself and family in the process. With today’s technology, evangelizing via the internet and social media has the ability to reach countless millions. And, just because Dollar (How ironic, that name, no?) claims to have 3 million followers worldwide who wish to see him, does not mean he needs to physically show up at their doorsteps via a Gulfstream G650. That really is so absurd! It does makes for comical reading, though. I have to admit! Good to see that he’s feeling some heat over it. Maybe it will restrain him somewhat. Though the materialistic and gullible people who follow him will likely ensure that he stays well-fed. I have no objection to people getting paid to do religious and spiritual work. That’s just how our culture works. Everyone has to eat. However, getting rich from spiritual work is questionable at best. If a minister or other spiritual leader truly cares about getting the Gospel out, why would he (or she) tolerate putting so much extra money toward his (or her) own pleasure and material gain rather than putting it to work reaching more people? Annette and I do hope to get our ministry to the point where it can pay for itself. But that’s mostly so that we don’t have spend many hours in the week working other jobs that we could instead spend spreading the good word to many more people who want and need it. Thanks for the moral support! We’re about to enter a whole no phase. We plan to considerably increase the visibility of our outreach in the coming years.